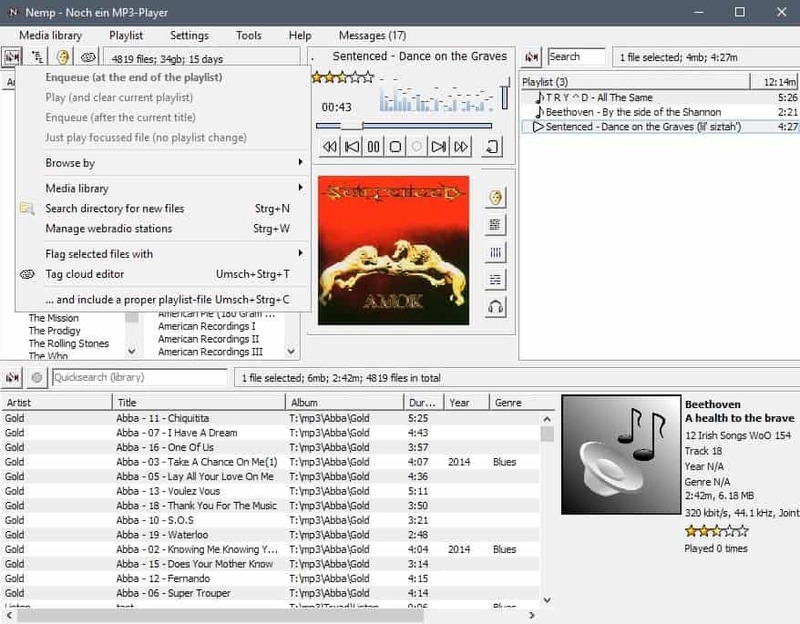 Nemp is an open source music player for Microsoft Windows PCs with a rich feature set that runs on very old versions of Windows as well as all supported versions of the operating system. Nemp, which stands for Noch Ein MP3 Player (Yet Another MP3 Player), is offered as a portable program. You can run the music player without installation, for instance on a USB Drive that stores your music collection. 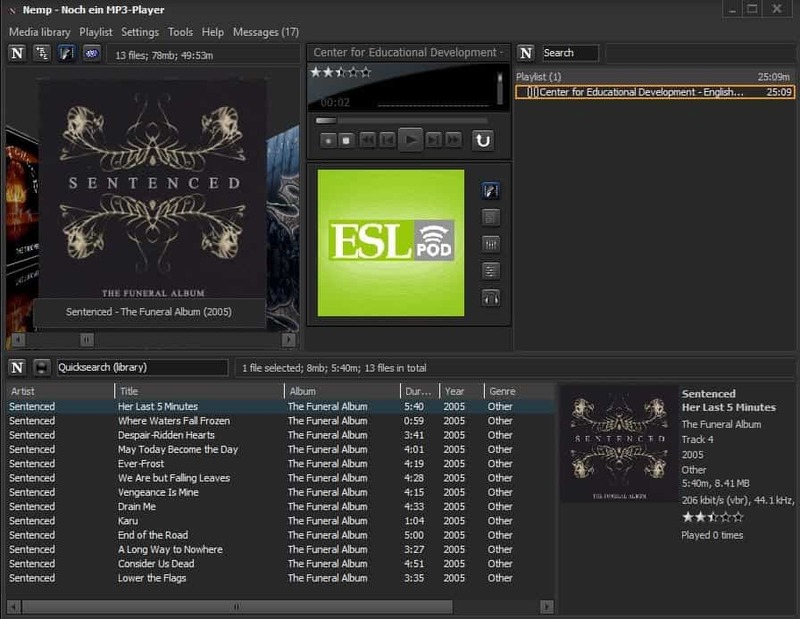 The player runs a wizard on first start that you may use to define important settings that include configuration of automatic updates, whether the player is allowed to modify the metadata of audio files, download cover art from Last.fm, or if it may adjust the rating and play counter of music files automatically. You can skip the wizard and load it with a click on Settings > Wizard. Nemp's interface is dark but you can switch to a light theme with a click on Settings > Skins > Windows default, or by downloading available skins to integrate them. The player uses different panes to display information. There is a pane for the album browser, playback controls, playlists, and the selected library folder. There is a lot going on even with a blank media library and playlist. First thing you may want to do is add music to the media library. You can drag & drop audio files or folders to the media library pane to have them scanned and added, or use the Media Library menu to initiate a scan. Nemp may monitor folders that you add for new music to add new files to the library automatically; handy. The music player supports audio files with the following extension: mp3, ogg, wav, wma, ogg, flac, ape, aac, m4a, mp4, mp2, mp1, aiff, mo3, it, xm, s3m, mtm, mod, umx, fla, oga, midi, mid, rmi, kar, mac, wv, mpc, mp+, mpp, ofr, ofs, tta, and cda (CD-Audio), and the playlist formats m3u, m3u8, pls, asx, wax and cue. Cover art is downloaded from Last.fm if you have selected that option and if no cover art is available. The player supports all popular audio formats and ID3v1, ID3v2, Ogg Vorbis comments, Flac metablocks and Apev2 tags that it displays and that you may edit. The default media library view displays covers but you can switch to a list view or tag cloud view instead. List view divides the music into artists and albums; it is the best view mode if you want an overview of the entire library. A click on an album populates the song list automatically. It lists artist names, album and song titles, play duration, genre and other information. Individual songs, albums and tags can be added to playlists. This works like in other players but you may find some of the provided options useful. You can play individual songs that are not on the playlist without changing the playlist, use headphone mode to play a song on a secondary audio card to preview it, and use various playing and enqueuing options. The position of the playback controls may require some getting used to if you keep the default interface. You find the controls in the middle of the interface. Nemp displays the cover art by default but you may switch to lyrics, the equalizer, effects or headphone view mode instead. Nemp supports lots of features, some big some small. You can run a web server to control Nemp using any device with a web browser, e.g. your smartphone. Birthday Mode to play a song at a specific time. Play jingles at the same time as the main song. Webradio support is built-in and you may record mp3 web radio. Last.fm users may use scrobbling. View detailed information (tags and other), and edit some. Configure Sleep Mode to change the power state of the PC after a selected time. Nemp is a powerful music player that comes with all the bells and whistles that you'd expect and some that may come as a surprise. The player used less than 30 Megabytes of memory and barely any CPU while it was used to playback local audio files and web radio streams. All in all a well designed player that is updated regularly. Now You: Which music player do you use? Nice to know this player exists, but I’ve been happy with foobar2000 for many years and I’m happy with it. Some people I suggested fb2k to refused to use it because they found it to be “ugly”, because it uses Windows’s shell and has no skin and installing a skin is a bit complicated. Good to know that at least NEMP has made it a lot easier to switch skins, but if I had to use it, I would use the skin that makes it look like part of Windows. Still just using good ol Winamp, last version of it. Just haven’t seen a need to use anything newer. I know theres security problems with its online radio parts, but I custom install and never use those anyway. One option I still love in Winamp that I haven’t found in any other music players is the option to enable 24 bit sound output. Hello. Can anyone comment on how this music player is compared to Musicbee? Design and Fioriture okay, but IMO a tech site like Ghacks should give complet infos about the sound in comparison to other best players at first. You are right. I have added the information to the review. Thanks. More specifically I would like to know, using a M-Audio card on a computer, the reason why with Foobar the audio quality is better than with MusicBee. And what about Nemp concerning the audio quality in comparison? Hi, that is a tough question. I’m not an audiophile and can’t really say. I suggest you try Nemp to judge for yourself. It is portable so that you can remove it if the audio quality is not up to par. As this has turned into a “everyone mentions their favorite” type of thread, rather than commenting on the original article, I may as well join in. I have been trying most media players out there (and continue to do so), including Nemp a few years ago. I did like it, but for some reason at the end of the day I always found myself returning to 1by1, the tiniest (both in terms of file size and system resource usage) MP3 player out there. I doesn’t have a media library, but for search terms I always use artist names and song titles – I’ve just never felt the need to use style tags or give stars to individual tracks or whatever else libraries let you do. That’s why I search for music the same way I search for any other local files, i.e. with Everything by Voidtools. Of course, this means that audio files must have proper names and/or be placed in a consistent folder structure, like “\artist\year album title\”. To play tracks from Spotify I use Spotiamb (formerly Spotiamp), a Winamp-clone. It’s not suitable for browsing around or managing playlists, but if you just want to play a specific song or artist, without being distracted, it’s much better than Spotify’s official desktop or Web client. It does require a subscription, however. I did use VLC 2. * for a few years, then recently came version 3, only installed it when 3.0.1 came out which had lots of quick bug fixes but it was still sorely broken in so many ways and used too much CPU (which was too much for my old PC). Then went back and checking out an old favorite I haven’t used for a long time, KMPlayer, and to my surprise they have been constantly improving it and a lot since last time few years back I used it, showed to be a very polished and solid media player in its current state, and it has web radio function too. Best of all, KMPlayer has MONO that really works, ie. down-mixing channels to a mono signal played back on all channels, users have asked and complained over at VLC for years but the developers have been quite obnoxious towards this request. For actual listening, it’s Music Player Daemon on a single purpose Linux “Digital Player” device made by Bryston. I’ve been using their very nice built in HTML interface in a browser as no MPD client I’ve tried has been all that compelling. For occasionally checking out a song on my regular computer, VLC or MPC-HC. Music Player Minion was probably the most loved MPD client but it’s a Firefox extension that was abandoned in 2011 and gradually became nonfunctional as FF continued to change. I still sometimes think about setting up FF3 on some old computer just to use Minion. Quite happy with MusicBee. Even managed to sync to my ancient iPod.